She is my first bike but I can't imagine having anything else! I just learned to ride a few months ago. After finishing the class, I set out to find my first bike. For two weeks I sat on many bikes and admired many more from afar. Then it happened. I sat on an '03 Magna at a local dealer. Then I sat on some others- then came back to the Magna. Walked away, came back. Many times. She just felt right. Perfect height, comfortable in every way. But she was a little more money then I wanted to spend and she was blue. I wanted black. I made a mental note that the Magna would be my bike of choice. That night I got a call from the friends who convinced me to ride and had their eyes peeled for bikes. They had seen a bike for sale and stopped to talk to the owner. It was an '01 Honda Magna. Black! I called the next day and went to look at her. She was beautiful. Shiny and flawless. I sat on her. My heart nearly jumped out of my chest, but I tried to remain cool. Being a new rider, I was too scared to even ride her so my friend took her up and down the driveway and gave her the thumbs up. Two days later she was in my garage. I dropped her on my first "parking lot practice" but she still treats me right. Being a V4, she is said to be able to smoke any 1100. I believe it. As I get more experience and gain more confidence, I am really enjoying her power. I don't see myself growing out of her anytime soon and I consider myself lucky to have her. I just finished the class on August 25th. Sure glad I did. My hubby and I bought a blue 03 Magna a few years ago. He just bought a Harley last week, so the Magna is mine. I love it. the only problem is the cluch lever is a bit of a chalenge for my little hand to reach. Other than that it is perfect. Any sugggestion about the lever? Your pic caught my eye as I googled images of Magnas. I just bought my second one & it looks almost exactly like yours. I had had a yellow '96 Magna that I learned on, sold it in '09 & regretted the decision ever since. When I decided I wanted another bike, I just kept coming back to the Magnas. Are they not the perfect bike? Who would want a Harley? I don't want to be getting my bike fixed when I can be riding! My black '97 is never going to be for sale! Amen! I agree on your Magna assessment. I have been riding for over 50 years, having many dirt dual sport, and road bikes. Now that I am older, 70, and live in AZ and HI I have 2 Magnas, one '96 and one '97. Yellow and Black stripes, and one solid yellow. It satisfies my need for speed when I want, and can also just slowly cruise around at the speed limit when I want, which is most of the time anymore. Enjoy the bike. I road a new Honda 800 V twin, and was not impressed. Much rather have my 15 year old Magnas. Congrats! I'm on a similar journey. I'm preparing for my written test and I'm looking for a bike. This one was highly recommended. I'm happy you are lovin' it! Girl power! I also drive a Magna (2000 black) Love it. It's the V4 power that was the fist attraction for me. I live in the Ozarks and was raised driving in the curves. The Magna is great on curves and loves to be speed shifted. Diana, you made a great choice! Be careful! Actually, it is just the stock seat (wish it were a Mustang).. I have recently purchased a 95 Honda Magna 750 V4, and am looking to change the passenger's seat and put on a backrest. Is the one in your picture a Mustang brand by any chance? Yes, I have had her for 1 year so far. I did put some scratches and a couple of small dents in the tank but nothing major. I still love my Magna - now that my second riding season is starting and I am more confident, I know I am going to have some fun! Do You Still Have the Magna? Diane: Do you still own that 01 Magna your talking about? You say you dropped it...you didn't wreck that baby did you or did you just put a few scratches on it? I just bought a 2001 Magna in black so I understand exactly how you felt. I have been riding for many years and had many bikes. This Magna brings something special that other cruisers don't: smooth power and speed with great handling! I hope you enjoy your bike for a long time. RIDE SAFE! Hi Diane and all! I am a new rider too, first bike is an '81 Honda 750c, a good old girl! Very comfortable... One of the first things I did was drop it in my driveway - I am fine on the road! but it was a small turn space situation... so I got THAT over with! I am learning on my own now, so I really appreciate all your comments here. Thanks! I don't ride with any "official groups"- I live in southern Mass (near Providence, RI). I am fortunate to have 2 very good friends that introduced me and my partner to riding so its usually just the 4 of us that ride together. We go to rallies once in a while (went to my first a couple weeks ago and possibly another one tomorrow) but we have not joined any womens riding groups. I have seen some online in the area but other then their websites I don't know much about them so I can't recommend any. I too am a new rider. 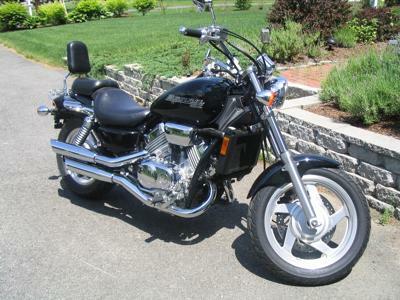 Took the class 3 weeks ago, this week I purchased a Honda Shadow VLX Deluxe. I love her...she feels good. Yesterday I dropped her in the parking lot practice. I really disappointed myself. Thanx for sharing your story . Now I know that I don't need to be so hard on myself and to just have fun. Your post made me feel so much better...guess I will go back to the lot this evening! It is so awesome when you find that one bike that makes your heart beat a bit faster that you know it is "love" at first sight. Enjoy & ride safe.